Note: This post is written with all due respect to the victims and their families, and was written with all available information as of the afternoon of December 14, 2012. They say you shouldn’t post things online when you’re angry or drunk. Well, one out of two isn’t bad. On Friday, amidst the nation’s shock and dismay at the mass murder of 18 schoolchildren in Newtown, Connecticut, CNN reported that Ryan Lanza was the shooter’s name and actually posted a link to his Facebook profile. The logic behind arming the unwitting and fuming masses with a digital pitchfork aside, CNN got it wrong. 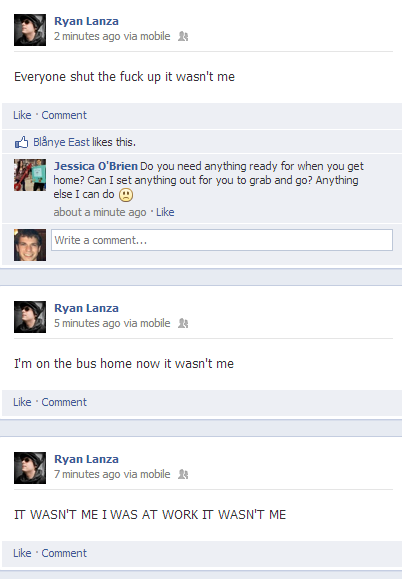 It was widely known that the shooter was dead at the conclusion of the murders, and soon there were screenshots circulating online of the very same Ryan Lanza posting on his Facebook that he was still indeed alive, on a bus, and was involved in a case of mistaken identity by CNN. Meanwhile, his Facebook profile picture was shared over 5,000 times by people posting messages about what a monster he was. And if I know the internet, I’m sure he and his Facebook friends got their share of online abuse. To their credit, Slate also mistakenly reported that Ryan was the shooter, but they later recanted their Tweet and posted the screenshot above. It’s hard to unring a bell, though. Among other choice words, Ryan wrote “F-ck you CNN…”. It’s hard to argue with that sentiment. Consider this: this young man Ryan (who lived in NJ at the time) heard about a shooting in his hometown, where his mother was killed. At some point, he was handcuffed by the police and interrogated knowing only parts of the story (learning that his brother was the perpetrator and also likely murdered their father). On top of that, his face is posted all over the internet and he’s labeled as a child murderer. All of this because CNN jumped to conclusions and speculated as to the identity of the shooter. It’s no secret that the 24-hour news cycle is a detriment to quality reporting. To use CNN as a top example, their heavy use of social media and crowdsourced reporting (e.g. iReport) as “sources” is reaching ludicrous levels. Who takes responsibility when a Twitter source is wrong? Clearly, not CNN. There are repercussions to sloppy news reporting. They say that history is written by the winners, and also that news is the first draft of history. If that’s the case, then CNN is making themselves out to be a big loser. Take responsibility for your editorial decisions, and rebuild your reputation. Otherwise, stop calling yourself a news organization. I think it is hypocritical of Barack Obama to make the stmtaeent that his Christian beliefs value the seperation of church and state. He needs to recap his history, the first act of congress was to hand bibles out to the people, and in fact some of the capitol buildings where used as churches. Look at what our founding fathers wrote pertaining to the declaration of independence and constitution of the united states. It seems God is mentioned by our goverment (then), why wouldn’t our goverment mention it now???? I think the Democratic party is struggling. When they can’t stand on their own merits all they can is Bash the republicans. And the republicans do the same. I’m really getting tired of the same old promises with no deliveries. Lets be honest, do you really think anyone of them would work for minimum wage???? They are all liars.Our true patriots would be turning over in their graves if they saw that circus on CNN. Why was Barac Obama able to talk as long as he wanted but pepole like Hillary and Dennis kucinch werent??? ?interesting to me that CNN SELECTIVELY picked out tough /insulting questions for only Hillary Clinton! !yet she still gives the best answers and in my opinion and many others won yet another debate!if your going to have another debate like this which btw didnt really work and was all over the place! !you need to not only pick on Hillary and Edwards but All the canidates need to get tough /personal questions! !it was pretty lopsided,I thought Dennis ,Hillary Joe Biden ,and Chris Dodd did the best! !Barac Obama once again never really asnwers the questions!and is the most abstract canidate ive ever seen.I wish someone would ask him a TOUGH question for once!because as it is he fumbles through the easy ones! !Over all I think Hillary Clinton won! !but this format does not work!